Pictured is original artwork of Juli Thurman currently on display at the Artesia museum’s art annex building. 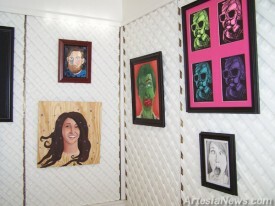 Original paintings, drawings and photographs from local artists Juli Thurman, JR Thurman, Mathew Sherman and Tyler Green will be on display at the Artesia Historical Museum and Art Center through June. An opening reception featuring an acoustic rock performance by SHILO will be held from 5-7:30 p.m. today at the museum. For more information, contact the art center by calling 748-2390.